Tiffany Foster and Artisan Farms’ Victor won the $84,000 Suncast 1.50m Classic. Photo by Sportfot. Wellington, Florida – Canadian Olympian Tiffany Foster of Vancouver, BC, rode a hot streak to the top of the $84,000 Suncast 1.50m Classic on Sunday, February 9, at the FTI Consulting Winter Equestrian Festival in Wellington, FL. On Thursday, Foster guided Victor to the win in the $125,000 Ruby et Violette WEF Challenge Cup Round V – Section B while on Saturday night, it was Verdi III that Foster piloted to a double clear round and a sixth place finish in the $370,000 World Cup Grand Prix, presented by Rolex. On Sunday, Foster was back in the spotlight, topping a 95-horse starting field to win the $84,000 Suncast 1.50m Classic. A total of 10 horse-rider combinations advanced to the jump-off over the track set by 2012 London Olympic course designer Bob Ellis of Great Britain, and it was Foster and her 2012 London Olympic mount, Victor, who held the key to victory. The pair sliced more than two full seconds off the leading time posted by world number one and reigning Olympic team gold medalist, Scott Brash of Great Britain. Foster’s time was 44.25 compared to Brash’s 46.75 seconds with Hello Annie. How does it feel to beat the number one ranked rider in the world? “That is the coolest part of the whole thing; I made him stand there and take a picture with me just to have proof that this actually happened!” laughed Foster, referring to the awards presentation. As a result of her success, Foster, 29, was also presented as the Martha W. Jolicoeur Leading Lady Rider for week five of the FTI Consulting Winter Equestrian Festival. 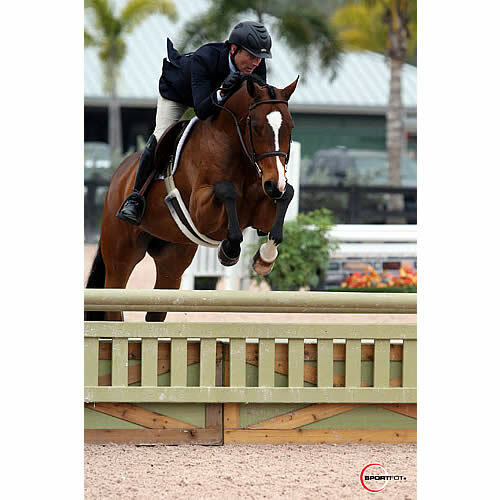 “Carlene and Andy Ziegler have been incredibly generous in supporting my career, and I can’t thank them enough for all they have done,” said Foster, who rides for the Ziegler family’s Artisan Farms, based in Wellington, Florida, and Vrasene, Belgium. Foster will continue to compete throughout the 12-week FTI Consulting Winter Equestrian Festival before returning to Belgium in the spring. Tiffany Foster guided Victor to victory in the $125,000 Ruby et Violette WEF Challenge Cup Round V – Section B. Photo by Sportfot. Wellington, Florida – Vancouver’s Tiffany Foster and Victor claimed victory in the $125,000 Ruby et Violette WEF Challenge Cup Round V – Section B held Thursday, February 6, at the FTI Consulting Winter Equestrian Festival in Wellington, FL. Two weeks earlier, the pair enjoyed the exact same placing, winning the $34,000 Ruby et Violette WEF Challenge Cup Round III – Section B on January 23. Wellington, FL – February 6, 2014 – Week five of the 2014 FTI Consulting Winter Equestrian Festival (FTI WEF) continued on Thursday afternoon with a shared victory for Ben Maher (GBR) aboard Urico and Tiffany Foster (CAN) riding Victor in the $125,000 Ruby et Violette WEF Challenge Cup Round 5. Held in a “California Split” due to the large number of entries, the competition awarded two sets of placings, each with $125,000 distributed. FTI WEF week five, sponsored by Rolex, runs February 5-9, 2014. The week will feature the $34,000 G&C Farm 1.45m on Friday, the $370,000 FEI World Cup Qualifier Grand Prix CSI-W 5* presented by Rolex on Saturday night, and the $84,000 Suncast 1.50m Championship Jumper Classic on Sunday afternoon. The FTI WEF, held at the Palm Beach International Equestrian Center (PBIEC) in Wellington, FL, features 12 weeks of world-class competition through March 30, awarding $8 million in prize money. Great Britain’s Robert Ellis set the course for the $125,000 Ruby et Violette WEF Challenge Cup Round 5 on Thursday in the International Arena at PBIEC. The class saw a record total of 116 entries in round one with 30 clear trips to narrow the field down for an impressive tie breaking jump-off. Twelve entries jumped clear over the short course, and Ben Maher had the fastest time of 43.44 seconds overall for the win in Section A of the class riding Jane Clark’s Urico. Tiffany Foster and Victor, owned by Artisan Farms and Torrey Pines, finished in 44.04 seconds for the win in Section B. The top three finishers in Section A included Maher and Urico, Reed Kessler (USA) and Kessler Show Stables’ Ligist in second with a time of 44.11 seconds, and Eric Lamaze (CAN) with Artisan Farms’ Zigali P S in third in 44.93 seconds. Section B saw a top finish for Foster and Victor, with Beezie Madden (USA) and Abigail Wexner’s Cortes ‘C’ in second with a time of 44.79 seconds, and Wilton Porter (USA) and Sleepy P Ranch LLC’s Paloubet in third in 44.96 seconds. Jane Clark’s horses had a fantastic day on Thursday with Urico and Cella both qualifying for the jump-off and having great rounds. Urico got the win and Cella had one rail over the short course and finished seventh in Section B. To add to the success, Clark’s dressage horse, Wellnetta, earned an FEI Grand Prix 3* victory across the street at the Adequan Global Dressage Festival with U.S. rider Katherine Bateson Chandler earlier in the day. Although Clark could not be in Wellington for the day’s top finishes, Ben Maher was happy to be a part of the winning team. He explained that he has made some adjustments to how he rides and prepares Urico since last year, and the changes seem to be working for the best. Maher commented on the course for Thursday’s class, noting that it was one of the most challenging that he has seen yet at this year’s competition. In addition to the prize money in Thursday’s class, Maher earned a special $3,000 bonus as part of the SSG ‘Go Clean for the Green’ promotion for wearing his SSG ‘Digital’ Riding Gloves. Each week of the Ruby et Violette WEF Challenge Cup Series, a $3,000 bonus will be awarded to the winning rider if they are wearing SSG ‘Digital’ Riding Gloves in all rounds of competition with the SSG logo clearly visible. Tiffany Foster and Victor continued their successful FTI WEF circuit with their second big win after also topping Section B of the $34,000 Ruby et Violette WEF Challenge Cup during week three. Foster was very happy with her rounds on Thursday and explained that she has gained confidence with their accomplishments. In addition to Victor, Foster has many great horses to show this year thanks to the support of Artisan Farms, and she is having a lot of fun with them as well. Also on Thursday, an $8,000 G&C Farm 1.45m jump-off class was held in the morning with a win for Venezuela’s Andres Rodriguez aboard Darlon van Groenhove. Abigail McArdle (USA) and David McArdle’s Cosma 20 won the Engel & Völkers High Amateur-Owner Jumper speed class. The Loddon Stalls Pre-Green Hunter Level 1 division was split into two sections on Thursday afternoon at the FTI WEF to accommodate the division’s large amount of entries. Jimmy Torano piloted Kyle Owen’s Messick to top honors in Section A and also finished as reserve champion with Pearl Street, owned by Jamie Jarvis. In Section B, Scott Stewart was awarded the division champion title with Wish, owned by Stewart’s Rivers Edge Farm and Annette and Leslie Pierce. The reserve champion for Section B was Palani K, ridden by Jeff Gogul and owned by Fred White. Torano and Messick won three over fences classes in addition to jumping to a fourth place finish. Stewart and Wish were second, sixth, and first over fences and won the under saddle class. Torano and his two mounts were matched up at the last minute after their usual rider, Peter Pletcher, had to take the week off following a minor injury. Pletcher of Magnolia, TX, asked Torano to step in and Torano and was pleased with how the seven-year old Westphalian gelding performed in the ring Thursday. “It’s a horse [owner Kyle Owens] bought off the internet that doesn’t have a lot of experience, but the horse went fantastically this week and won three classes. It really looks like a nice horse for the future,” Torano, of Ft. Lauderdale, FL, noted. Coincidentally, Torano helped Pletcher with Messick a few weeks before temporarily taking the reins over on Messick, so he didn’t have to go into Thursday’s division completely blind. “I watched [Messick] go a little bit. He’s a typical hunter. He goes without a martingale; he goes in his own frame with nice balance. He’s got a great way of going. Luckily I got to watch him go with Peter and Kyle two weeks ago,” Torano explained. Torano’s first impression of the horse proved to be true. He described Messick as an even-tempered and simple ride, relatively unaffected by the busy show atmosphere. While Torano and Messick were freshly matched, Stewart and his champion mount have a much closer history. Stewart and partner Ken Berkley own Wish with Annette Leslie Pierce and bred the four-year-old Warmblood gelding themselves. “He’s is the first one that’s old enough that we bred. He’s out of a mare we had called Hush and he’s by a stallion I used to show, Be Cool,” Stewart detailed. The first time Stewart got on Wish, he fell in love with his natural way of going and admitted he didn’t have to do much on the flat training-wise. “He’s a beautiful mover and a beautiful horse. The way he canters in between the jumps, he just carries himself like a natural hunter and he wants to carry himself in that frame,” Stewart described. Wish has also remained cool and collected despite the fifth week of the FTI WEF only being his third show. For that, Stewart credited his incredibly easy-going personality. That doesn’t mean the gelding is immune to any “green” moments, which Stewart simply laughed off. “Putting the ribbon on his bridle scared him a little bit!” Stewart commented of the pair’s division championship presentation. While Wish will take the next few weeks off before returning for the USHJA Pre-Green Incentive Program classes to be held Week 7 of the FTI WEF, hunter competition continues on Friday with the WEF Collegiate Equitation Championships. The $34,000 G&C Farm 1.45m will be featured in the International Arena. For full results, please visit www.showgroundslive.com. Canada’s Tiffany Foster guided Victor to victory in the $34,000 Ruby et Violette WEF Challenge Cup Round III – Section B. Photo by Sportfot. 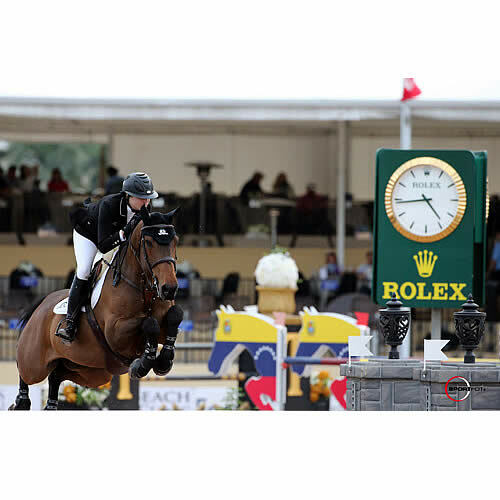 Wellington, Florida – Canada’s Tiffany Foster emerged victorious in the $34,000 Ruby et Violette WEF Challenge Cup Round III – Section B held Thursday, January 23, at the FTI Consulting Winter Equestrian Festival in Wellington, FL. A total of 92 horses attempted the first round track set by course designer Guilherme Jorge with 25 posting clear rounds to advance to the jump-off. Returning for the jump-off mid-way through the order, Foster guided Victor to a blazing fast round in a time of 40.50 seconds to take over the lead from her 2012 London Olympic teammate, Ian Millar, who had stopped the clock in 40.84 seconds riding Dixson. Only one rider, Todd Minikus, was able to better her time, crossing the timers in 40.34 seconds riding Quality Girl to take the win in Section A while Foster was crowned the victor of Section B. Now in their fourth season together, Foster and Victor, a 12-year-old Dutch Warmblood gelding (Elmshorn x Grandeur) owned by Torrey Pines Stable and Artisan Farms LLC, are no strangers to the International Arena at the FTI Consulting Winter Equestrian Festival. They were members of Canada’s Nations’ Cup team in Wellington in both 2012 and 2013, posting clear rounds on both occasions. 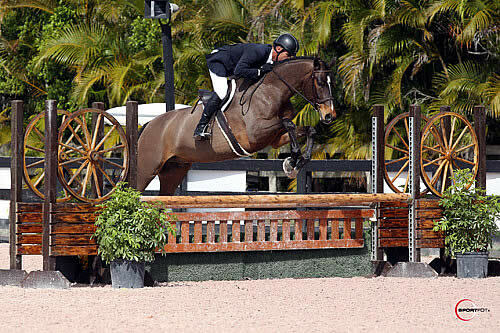 Foster even out-raced her coach, 2008 Canadian Olympic Champion Eric Lamaze, who placed third riding Zigali P S in only their third competitive appearance together. Foster competes at the grand prix level with Victor as well as Verdi III, a new mount acquired in June of 2013 by her owners, Andy and Carlene Ziegler of Artisan Farms LLC. In addition, she has several young prospects she is developing for Artisan Farms of Wellington, Florida, and Vrasene, Belgium.